Romney won the debate but not the war. True to the longstanding Hollywood tradition, the evil villain was defeated at the end of the show last night but was allowed to survive for another sequel. Yes, Mitt Romney did a good job pummeling Barack Hussein Obama throughout the debate but missed a couple of good opportunities to bury the hatchet deep inside his weakened opponent and finish him off. When Obama twice brought up the approval of his socialized medicine plan by the left-leaning AARP, a group that has since tried to distance itself from the Democrats by asking that they not be mentioned by name, Mitt Romney had the opportunity to reveal that the reason the AARP has endorsed Obamacare was that they stand to make some $30-million dollars in profit from selling Obama’s health care plans to its members. Romney also failed to bring up the huge number of AARP members who left the seniors group after the AARP began to align itself with Obamacare. And when the numbers of unemployed were bandied about, Mitt Romney continued to use the current standard figure of 8.1% and the 23-million head count instead of the much higher totals that include those long-term unemployed who have given up looking for jobs. Just because the Dept. of Labor has twice revised the way unemployment numbers are calculated in the last decade doesn’t mean the Republicans have to repeat it. That misleading 8.1% figure just says that 23-million unemployed people are looking for work. It fails to account for the gross number of people who have drifted over to apply for welfare and food stamps. According to current methods of accounting, when a person has exhausted all of their unemployment checks they are dropped from the tally of the unemployed. Had Mitt Romney addressed the unemployment number completely he would have informed the viewers that the true, total numbers of people who are out of work is closer to 20% and not the 8.1% (which is bad enough). That board of professionals will be deciding which senior citizens will be given treatment and which will be denied treatment and allowed to die. Those that have been determined to be useful and productive to society will be allowed to live and those that are not will be considered unworthy. And lastly, Mitt Romney failed to mention the 16,000 people that will be hired by the IRS to go around and verify that every citizen has a valid health insurance plan. Those found to be without insurance will be faced with stiff fines. Mitt Romney also needs to be aware of the media bias that surrounds the television production of these debates. The TV cameras frequently focused on Romney’s face and as he continued to glance to his left to watch Obama speak, his eyes looked wet and tearful and his facial expressions appeared to lack confidence. This problem is similar to the mistake Richard Nixon made in the Kennedy/Nixon debates when Nixon refused to wear makeup under the harsh studio lights and he looked like he had a dark 5 o’clock shadow. An image that created the sinister appearance of an untrustworthy character. On the plus side, Mitt Romney had a lot of good factual information to throw at Obama and used those facts and figures as a barrage of jabs to keep Obama off guard. It is too bad he used only jabs instead of knockout punches. I would have preferred it if Mitt Romney had unleashed such a barrage of criticisms onto Barack Obama that his over-inflated ego would explode and he would be reduced to a quivering, tearful lump. Maybe Mitt will be encouraged to do so in the next debate after reading of his victory last night. Gov. Mitt Romney’s nearly total decimation of incumbent, President Barack Obama, during the first of three presidential debates last night, provided a fundamental turning point in the race to The White House which, according to the post-debate ‘instant polling’ of viewers, now geometrically favors Republicans by more than a two-to-one margin. In fact, the CBS poll of 500 ‘Undecided Voters’ handed Romney a 46 to 22 percent victory. Then there was the stinging CNN/ORC ‘scientific poll’ of ‘Registered Voters’ was even more demonstrative, giving Romney a commanding 67-25 upset over President Obama, according to Dan Gainor’s FOXNews article today. As a result of being torpedoed below the waterline, the Obama campaign is in full ‘damage-control mode,’ defaulting to their favorite defensive [cover-up] weapon–the ‘blame-machine’–attempting to sell the idea that the president’s feckless debate performance was a one-off ‘fluke’ (no Sandra pun intended), altitude sickness, or somehow the fault of debate moderator Jim Lehrer of PBS–who actually tried to ‘coach’ Obama a half-dozen times during the evening. And, for their part, the mainstream media has deployed legions of [Liberal] fact-checkers, who will impotently dissect every word that came out of Gov. Romney’s mouth, in the hopes of having any story that will salvage the Obama-train wreck. Regardless, what really happened last night, that caused weeping and wailing, shock and denial among all the anchors, reporters and Liberal talking heads on all of the alphabet network and cable stations, was the total ‘de-cloaking’ of their false God. Last night debate viewers witnessed the ‘real’ American president, Barack Hussein Obama, who without his ever present teleprompter, mainstream media protection, and campaign special effects that would George Lucas jealous, is really just a prattling, narcissistic ‘poser,’ who was given a complete, un-vetted ‘pass’ by an adoring mainstream media–because they knew he was totally unequipped for the job–and bolstered by Oprah Winfrey’s highest recommendation, before a live Chicago studio audience and the rest of the entire world. Obama please be Obama! You sound like a Democrat [wimpy]. This unequivocal ‘outing’ of President Obama last night, serves as the starkest measure yet of the extraordinary amount of Liberal-biased influence the mainstream media possesses. And, while acting in concert, it was able to utilize the public airwaves, to effectively elect a man totally incapable of being President of the United States–then continue to support, or even ‘protect,’ what is likely the most corrupt, and certainly the most damaging, presidential administration in history. 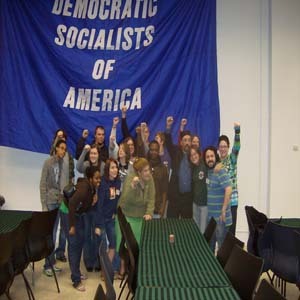 The US’s largest Marxist organization, Democratic Socialists of America, has always placed a very high priority on saddling America, with a “single payer” or socialized health care system. The DSA Marxists see the Affordable Health Care Act, or Obamacare, as a significant stepping stone in this direction. We’ve met some of the modest goals that the national leadership set when DSA decided to make support for a single-payer Canadian-style health care system our major issue. DSA members have served on the Clinton Health Care Task Force and in the leadership and rank and file of national and state single-payer coalitions. Perhaps most importantly, in 1991 we organized a twenty-two-city national tour of over forty Canadian health experts (from our sibling party, the New Democrats) that helped to galvanize the single-payer movement into action. No other organization was in a position to carry out such a major tour. We have done a good job as the socialist current within the single-payer movement, but still have significant opportunities to improve DSA locals’ level of activism and our recruitment of activists into DSA through this issue. In the coming year, as we close in for the final legislative phase of this fight, the national DSA leadership and the DSA health care task force will focus efforts in these two areas. The DSA National Convention in November unanimously adopted a resolution that clearly reaffirmed our support of the McDermott-Conyers-Wellstone single-payer bills (HR1200/S491). It also stipulated DSA’s advocacy of a “state option” for single payer in the final legislative package. The resolution also stated that DSA will organize and participate in anti-corporate campaigns targeting private health insurance, pharmaceutical lobbies, and any other corporate or political forces that seek to destroy real reform. While Barack Obama has consistently denied that his goal is socialized healthcare, he is clearly lying through his teeth. 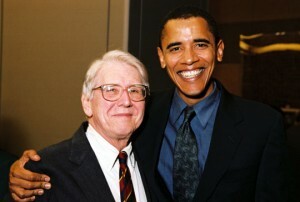 Obama’s personal physician in Chicago for many years, Quentin Young, is a leading DSA member and the father of the US “single payer” movement. Young has openly claimed credit, on at least several occasions, for indoctrinating Obama into the concept of socialized health care. Barack Obama, in those early days—influenced, I hope, by me and others—categorically said single payer was the best way, and he would inaugurate it if he could get the support, meaning majorities in both houses, which he’s got, and the presidency, which he’s got. And he said that on more than one occasion, and it represented the very high-grade intelligence we all know Barack has…. MIT academic and former Massachusetts state rep. John McDonough, was given credit in a recent Obama campaign video for designing Obamacare. McDonough was for several years, the chairman of Boston Democratic Socialists of America. Here, three long time DSA affiliates, Barack Obama and reps Jan Schakowsky and Barney Frank, reveal their true intentions to completely socialize US medicine. Obama’s America to become a Client State of Iran before Election? Q: When is international negotiation by a president treachery by a traitor? A: When the presumed Commander in Chief is saboteur in chief. Iran could announce a temporary halt to uranium enrichment before next month’s U.S. election in a move to save Barack Obama’s presidency, a source affiliated with high Iranian officials said today. The source, who remains anonymous for security reasons, said a representative of the Obama administration engaged in secret negotiations yesterday with a representative of Iranian Supreme Leader Ayatollah Ali Khamenei. The Obama representative has urged the Iranian leader to announce a halt to enrichment, even if temporary, before the Nov. 6 election, promising removal of some sanctions. The source said the Obama representative warned that a Mitt Romney presidency would change the U.S. relationship with Iran regarding its nuclear program. The U.S. representative reminded the Iranians that President Obama has stood in front of Israel, preventing the Jewish state from attacking Iran over its illicit nuclear arms policy. Yesterday’s meeting, which took place in Doha, Qatar, was coordinated by the Qatar monarchy, whose members attended at the request of the Obama administration. If true (and I have no reason to believe it is untrue) no wonder the U.S. delegation refused to leave, when Ahmadinejad spoke at the United Nations, a few days ago. No wonder, U.N. 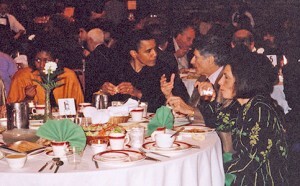 Ambassador Susan Rice was out munching with Secretary of State Hillary Clinton, when Benjamin Netanyahu spoke. No wonder, Barack Hussein Obama just laid low, before becoming “eye candy” on The View. Cliff Kincaid spoke at the recent AIM conference, “ObamaNation: A Day of Truth,” about several of Barack Obama’s most influential, and radical, influences. 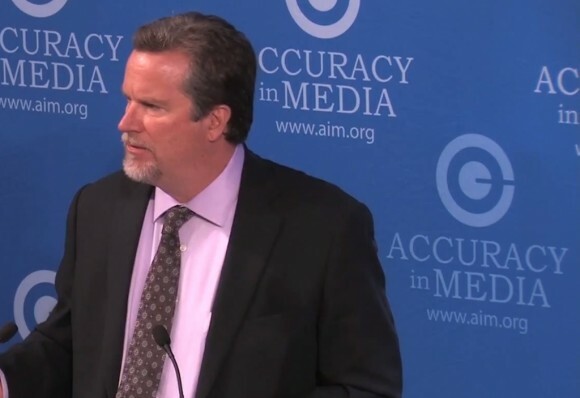 Kincaid, the Director of the AIM Center for Investigative Journalism, and associated with AIM since 1978, brought up several “taboo” subjects that the media prefer to ignore. Frank Marshall Davis, Obama’s mentor in Hawaii during his critical teen years, was a member of the Communist Party, as his FBI files revealed. William Ayers, the unrepentant terrorist and a founder of The Weather Underground, was closely associated with Obama in Chicago. Kincaid has been a leader in bringing this information to light. This speech was from the same AIM conference where Pat Caddell, Bishop E.W. Jackson, Sr., and Katie Pavlich spoke. We will present more of the speakers in the coming days. Want a personal account of how Obama’s EPA and government goons have truly screwed up someone’s life? 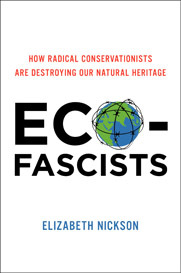 Look no further than Elizabeth Nickson who has written a great book: Eco-Fascists – How Radical Conservationists Are Destroying Our Natural Heritage. She just wanted to build a house on her 28 acres – but environmentalists stepped in and so began her nightmare and her research. Forty million Americans have been driven from their lands and rural culture is being systematically crushed, even as wildlife, forests, and rangelands are dying. Journalist Elizabeth Nickson’s investigations into these events have revealed a shocking truth: rather than safeguarding our environment, radical conservationists are actually destroying our natural heritage. In Eco-Fascists, Nickson documents the destructive impact of the environmental movement in North America and beyond, detailing the extreme damage environmental radicals in local and national government agencies are doing to the land, the ecosystems, and the people. Readers of Alston Chase’s Playing God in Yellowstone and In a Dark Wood, and anyone who is deeply concerned about global warming and the environment must read Elizabeth Nickson’s Eco-Fascists. An investigative reporter documents the destructive impact of the environmental movement in North America and beyond. Cass Sunstein, is that you? And any number of other Marxist regulators in our government. This is a great book, especially if you want to know how the environmental whackadoos are impacting our lives, our country and our constitutional rights. This is a big deal in Idaho, where I live as well as most other states. Get Eco-Fascists and read and study it. Forewarned is forearmed.